Two new rookies made their debuts on Saturday night! Nutella Ferrero just got drafted to the Shocks and Alicia Brains to the Stix. The game started out with a 12-0 jam from Jammunition for the Shocks, but in the following several jams, the Stix earned lead jammer and brought the score to almost even at 16-13. 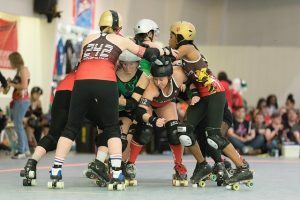 In the fourth jam of the game, and her very first jam as an Atlanta Rollergirl, Alicia earned lead jammer for the Stix! Unfortunately, the other jammer got out close behind and she had to call for a 0-0 jam. The revolving door to the penalty box kept both teams from full strength packs for most of the game, with the Stix being the hardest hit. Even the numerous lead jams from Nora Gretz weren’t enough to keep the score close. The first half ended with Shocks in the lead 100-33. Nutella got her chance to jam in the 2nd half, and got her team 10 points on a power jam. More lead jams for Nora and Switchblade Siouxsie (subbing in for Belle of the Brawl) brought the score much closer, but the Shocks still ended with the win. Final Score was Shocks 162, Stix 111. Players of the Game were Jammunition for the Shocks and Nora Gretz for the Stix.